This is the first game in the Battlestations series. For other games in the series see the Battlestations category. 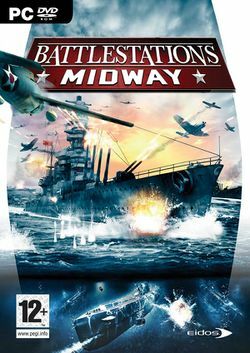 Battlestations: Midway is a real-time tactics video game developed by the Hungary division of Eidos Interactive. Set in the Pacific theatre of the Second World War, Battlestations: Midway (often abbreviated to "Battlestations" or "BSM") is a hybrid of real-time strategy, flight simulation, as well as naval and submarine warfare. Players can activate a real-time map which allows them control over their units like an RTS game would, while giving them the ability to personally command at any time one of any number of warships, aircraft, submarines, or two forms of land installations. Several players have made connections from BSM to the Battlefield series, except without land or infantry combat. The single player campaign has a rather weak storyline, following two main characters. Henry Walker is a Lieutenant on board the USS Phoenix, arriving just in time to witness and partake in the attack on Pearl Harbour. Players switch from the perspective of Henry to his air force friend and counterpart, Donald Locklear, as they strive through the various missions of the game to push back the Imperial Japanese Navy. The campaign draws to a close at the Battle of Midway. Various challenge missions involve commanding a particular type of unit – an aircraft, a warship, or a submarine – to accomplish various objectives. Challenge missions can be accomplished before or after the actual campaign, although it is recommended players play the campaign first since Challenge missions are exceedingly difficult, even for those who have defeated the Campaign. There is no Japanese campaign, however the challenge missions offer the chance to play as the Japanese in single-player mode. Japanese characters speak in Japanese, so subtitles must be enabled to determine what they are saying. The game has a direct sequel - Battlestations: Pacific. With the shutdown of GameSpy, this game no longer has any multiplayer functionality on PC. Thus far, two patches have been released — Versions 1.1 and Versions 1.1.1. One downloadable expansion pack was released, the Iowa Mission Pack, updating the game with one new multiplayer map and a new challenge mission. The multiplayer map and challenge mission introduce the player to the new units of the expansion pack. The expansion isn't free for the Xbox 360, however. It should be noted that the patch download links do not work with downloaded versions. This includes primarily versions downloaded via Steam, Direct2Drive, or other such sites. Direct2Drive has a site through which you can patch your game if you purchased it via download. Recently some members of the community have created their own map packs by hacking the game's source files. It can be downloaded from the External Links section below. A multiplayer demo was released and made available for download, but unfortunately the demo has several connection issues, particularly when connecting to the internet. This is because the multiplayer demo has not been updated with patches 1.1 and 1.1.1. This makes the demo almost completely useless. Only LAN games work with the demo. The Xbox 360 demo remains fully functional. Only one cheat is available for each system. PC: Type in "Henry Walker" as a profile name. This automatically unlocks all missions, Unit Identification data, movies, as well as all the challenge missions. It should be noted that this does not give you medals. Xbox 360: Hold + + + , push . This unlocks all levels. This page was last edited on 16 August 2016, at 16:11. This page has been accessed 160,041 times.